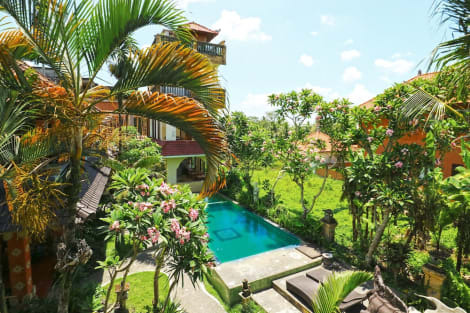 This resort is located at the heart of Ubud, bathed in the rich artistic and cultural heritage of the area. The resort is located just a 45 minutes' driving distance from Bali International Airport. This wonderful resort is built on a beautifully-situated terrace, overlooking green rice paddies and majestic volcanic hills. This stunning resort envelops visitors in the sheer natural beauty of the area. The resort comprises elegantly-appointed guest rooms, which offer an insight into the traditional Balinese style. The guest rooms are well equipped with modern amenities, for added comfort and convenience. Guests will appreciate the range of facilities and services that the resort has to offer. Grab a bite at Wanara Restaurant, one of the hotel's 2 restaurants, or stay in and take advantage of the room service (during limited hours). Buffet breakfasts are available daily from 6 AM to 10 AM for a fee.